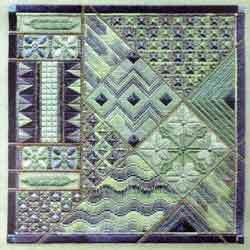 Description: This pattern was designed to use one varigated cotton or silk thread and by making it with three different sets of contrast colors, show how the varigated colors change when matched with different colorways - yet maintain an overall sense of unity. Includes detailed stitching instructions and diagrams. 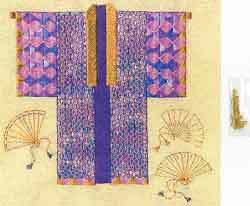 Description: 'Kimono with Fans' is from the designers Kimono Collection. 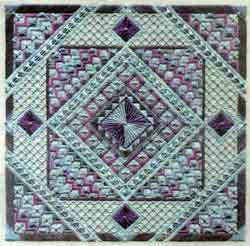 It has developed from her fascination with playing with variegated threads to create patterns that emulate oriental textiles. Letting the variegated thread colors flow as they will across the design is part of the fun in stitching these striking kimonos! While these kimonos were designed to be stitched on 24 ct. Congress Cloth, they can also be stitched up on 18 ct. mono canvas. 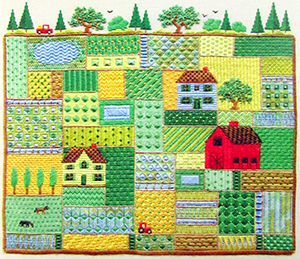 The image is larger of course, but equally stunning and just as enjoyable to stitch! 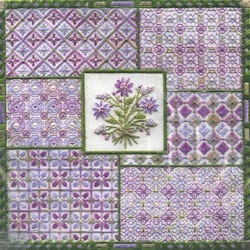 Description: 'Lilac Collage' is part of the designers The Secret Garden Collection. 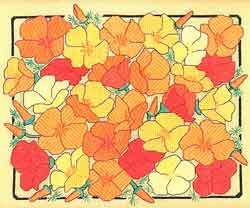 These floral collages are very fun to stitch on 18 ct canvas; they showcase a tent-stitched flower in the center, with composite patterns and ribbons stitched in the surrounding areas. 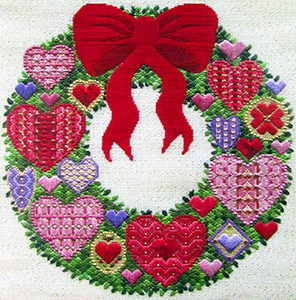 The magic of working with variegated threads, metallic ribbons, beads and a collection of composite stitches gives this piece plenty of variety and lots to look at while you're stitching. 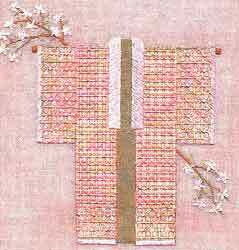 Description: 'Apple Blossom Kimono' is from the Kimono Collection and has developed from the designer's fascination with playing with varigated threads to create patterns that emulate oriental textiles. Letting the varigated thread colors flow as they will across the design is part of the fun in stitching these striking kimonos! Description: 'Tucson Twilight' is part of the designer's 'The Impressionist Collection'. 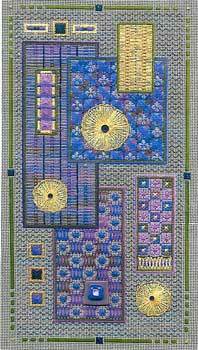 This collection showcases modern samplers that use variegated threads, beads, jewels, and elaborate composite stitches that create sophisticated and eye-catching designs that are as much fun to stitch as they are to look at. Description: This design is from the designer's 'The Impressionist Collection'. 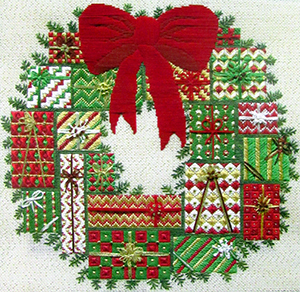 This collection showcases modern samplers that use variegated threads, beads, jewels, and elaborate composite stitches that create sophisticated and eye-catching designs that are as much fun to stitch as they are to look at. 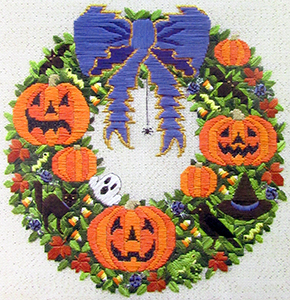 The jewels and beads included with this pattern are intended to be mixed - yellow and amber, circles or squares, rounds and bugles - and any combination will work and be equally elegant and dazzling to the eye. 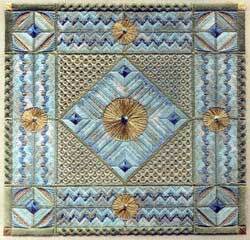 Description: This design is from the 'Secret Garden Collection'. This collection includes a series of floral portraits done on Congress Cloth that employ a variety of stitches to replicate the changing color and movement of light on flowers. There is sure to be something to interest any gardener here! 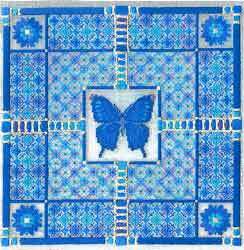 Description: "Blue Butterfly" includes detailed stitching instructions and detailed charts. 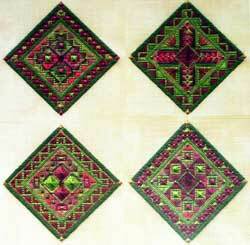 Description: Sampler Collection; includes small gold seed beads and large #8 gold beads. Four other color suggestions (peach, purple, pink, and blue) included. 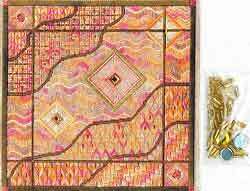 Description: Sampler Collection; includes small gold seed beads and large #8 gold beads. 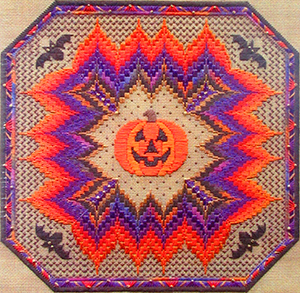 Another Autumn color combination (orange and teal) is included. 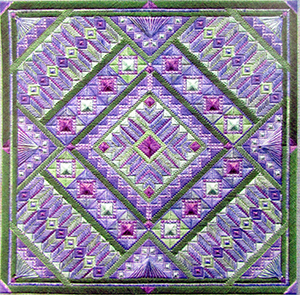 Description: Various stitches for a purple and teal palette; suggestion for different color palette included. Includes jewels and crystal beads. Description: Design can be stitched on either 18ct or 24ct; gold beads are included. Suggestions for other color palettes included. 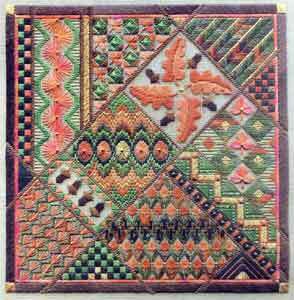 Description: These modern samplers use variegated threads, beads, jewels and elaborate patterns to create sophisticated, eye-catching designs that are as much fun to stitch as they are to look at. They are designed to highlight variegated threads and come with a variety of jewels and beads to enrich and embellish your stitching experience. 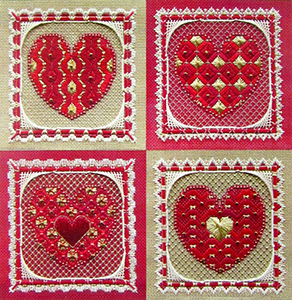 Designed with the experienced stitcher in mind, they combine simple stitches with a variety of variegated threads and an assortment of metallic threads to provide a real treat for stitchers who enjoy working intricate geometric counted canvaswork. Description: Impressionist Collection. This design was built around an autumn palette of rusts, greens and browns. 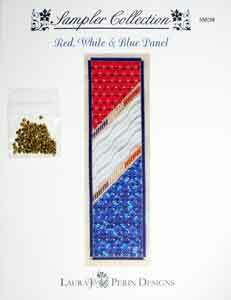 Includes assorted seed beads and bugle beads. 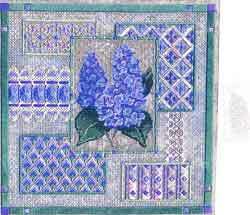 Description: A blue and purple design consisting mainly of diamonds. Includes 8mm silver beads. 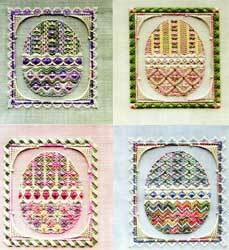 Design Size: 4.5" x 5.25"
Description: Four different eggs, four different borders , four different colorways - lots of ways to play and stitch! 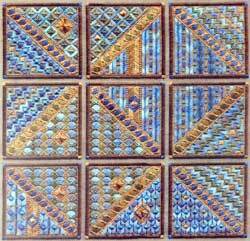 Includes gold seed beads. Thread count: 84W x 94H. 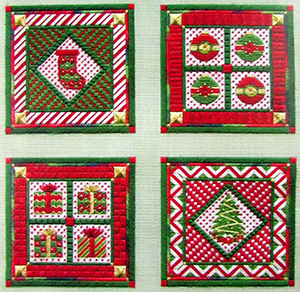 Design Size: 4.5" x 16"
Description: This pattern includes four different boarder patterns that can be added to "square up" these ornaments and make a 6" x 6" square design. Includes four 7mm topaz Swarovski crystals and two color variations. Thread count: 108W x 108H each. Design Size: 12.5" x 12.5"
Design Size: 11" x 8.5"
Design Size: 9.75" x 9.75"
Design Size: 4.5" x 16.25"
Design Size: 10" x 7.25"
Design Size: 11" x 12"
Design Size: 11.25" x 10.5"
Description: This design is lso available for 24ct. Includes beads. 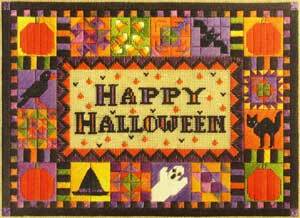 220x218 stitches. Description: Includes Beads. 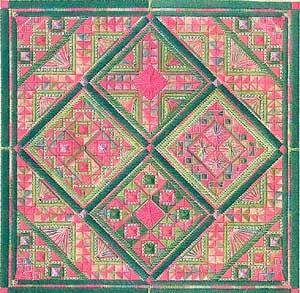 186x186 stitches. 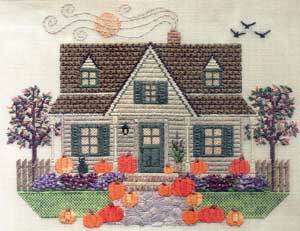 Description: This design is from Laura J. Perin's "Impressionist Collection". 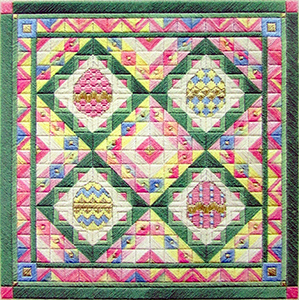 This collection showcases modern samplers that use variegated threads, beads, jewels, and elaborate composite stitches that create sophisticated and eye-catching designs that are as much fun to stitch as they are to look at. The beads are included with this chart. 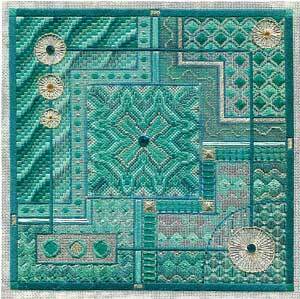 Description: This design is from Laura J. Perin's "Sampler Collection". 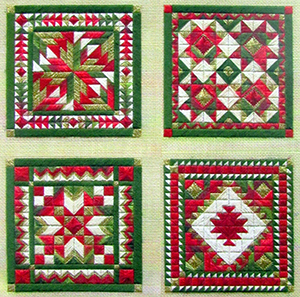 This collection contains an assortment of sampler designs that employ a variety of stitches in their design. 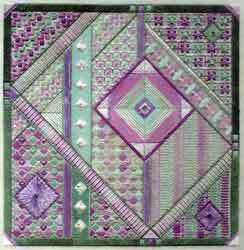 These samplers run the gamut from traditional cross-stitched designs on linen to abstract geometrics that often feature modern fused glass jewels, ancient celtic designs, and mythical creatures. 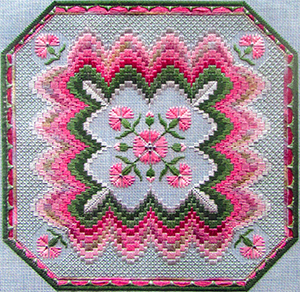 Description: This design comes with alternative thread suggestions for a 'Pink Cyclamen' design or 'Purple Cyclamen' design.This design is from Laura J. Perin's "Secret Garden Collection". 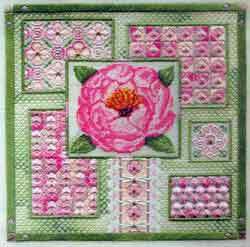 These floral collages are very fun to stitch on 18 ct canvas; they showcase a tent-stitched flower in the center, with composite patterns and ribbons stitched in the surrounding areas. 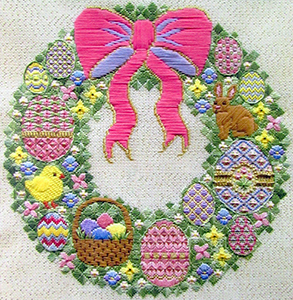 The magic of working with variegated threads, metallic ribbons, beads and a collection of composite stitches gives this piece plenty of variety and lots to look at while you're stitching. Description: This design comes with alternative thread suggestions for a choice of Red, Pink, or Purple bow. 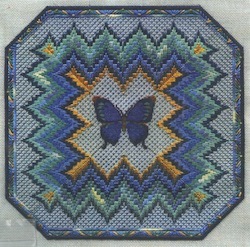 This design is from Laura J. Perin's "Sampler Collection". 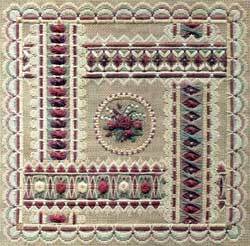 This collection contains an assortment of sampler designs that employ a variety of stitches in their design. 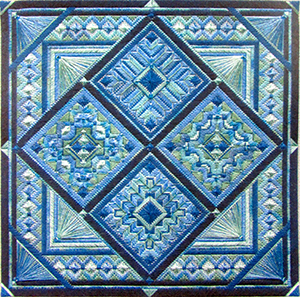 These samplers run the gamut from traditional cross-stitched designs on linen to abstract geometrics that often feature modern fused glass jewels, ancient celtic designs, and mythical creatures. 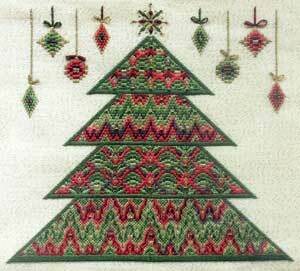 Description: This design comes with alternative thread suggestions for a choice of a traditional Christmas bright red & green palette, a more muted red & green palette, or a Chanukah blue & gold palette.This design is from Laura J. Perin's "American Quilt Collection". 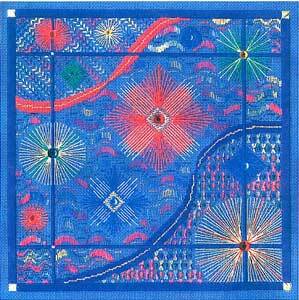 This collection creates classic quilt designs on 18 ct. mono canvas (they can also be worked on 24 ct. Congress Cloth). 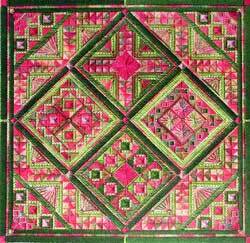 All of the quilts are worked in variations of a diagonal satin stitch that works up fast, easy and fun. 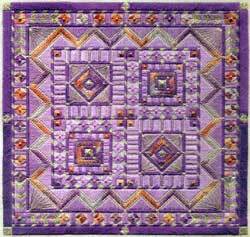 These quilts are good "no-brainer" projects; they may look complex, but are actually very easy to stitch. Description: This design comes with options between horses or cows to be stitched in the fields. 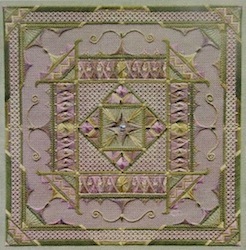 This design is from Laura J. Perin's "Sampler Collection". 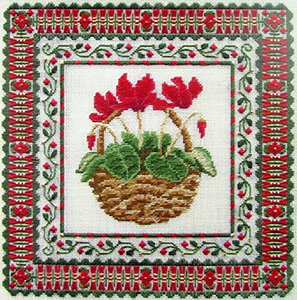 This collection contains an assortment of sampler designs that employ a variety of stitches in their design. 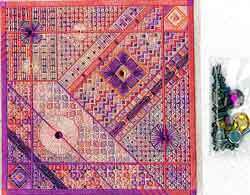 These samplers run the gamut from traditional cross-stitched designs on linen to abstract geometrics that often feature modern fused glass jewels, ancient celtic designs, and mythical creatures. 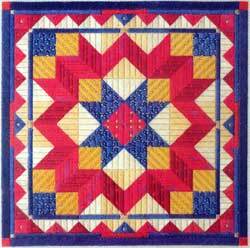 Description: This design is from Laura J. Perin's "American Quilt Collection". 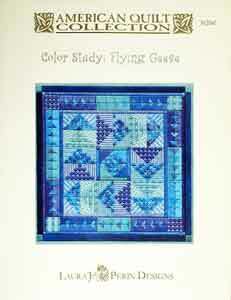 This collection creates classic quilt designs on 18 ct. mono canvas (they can also be worked on 24 ct. Congress Cloth). 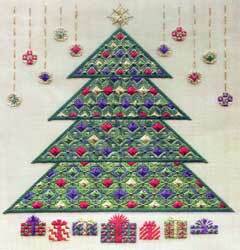 All of the quilts are worked in variations of a diagonal satin stitch that works up fast, easy and fun. 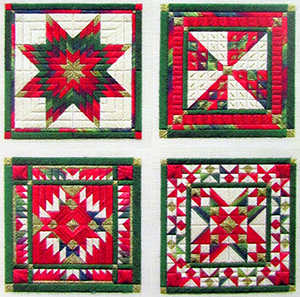 These quilts are good "no-brainer" projects; they may look complex, but are actually very easy to stitch.